These classic swingsets will keep your kids in the air for hours! The galvanized steel piping guarantees sturdy construction. 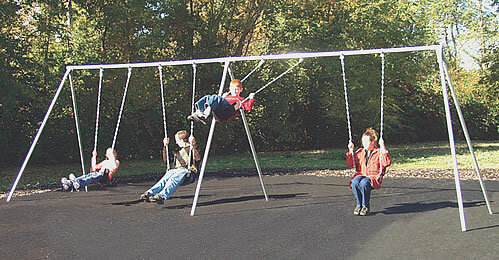 These special needs swingset structures are available in heights of 8 feet and 10 feet. Choose between models with 8 seats, 6 seats, 4 seats, or 2 seats (the photo above shows a 4-seat model). Included: All of our special needs swingset structures come with galvanized steel pipes, self lubricating swing hangers, 4/0 galvanized welded chain, and cut-proof seats. To make this unit accessible to special needs kids, you can substitute in ADA seats (please contact us for final pricing). Interested in the Primary Bipod Swing Sets?